AFC Asian Cup - Qatar 1 Iraq 0 - Live! Bassam Al-Rawi, son of former Iraq international Hisham Al-Rawi scored a stunning free-kick as Qatar booked their place in the quarter-finals against South Korea with a hard fought 1-0 win over Iraq. Al Anabi were dominated by their opponents for large swathes of the second half, but a composed defensive performance saw the 2022 World Cup hosts progress. Qatar surprisingly started on the front foot and with just three minutes on the clock, Abdulkarim Hassan rattled the crossbar as Khoukhi Boualem’s cross evaded the Iraq defence and fell to the AFC player of the year, who failed to convert the early opportunity. It was all Qatar in the opening exchanges and Al Anabi could have feasibly had a penalty. Almoez Ali sprinted through to a long-ball and tumbled under pressure from keeper Jalal Hassan. The referee waived any claims away for a penalty, and on a second look he was right. Felix Sanchez’s side went toe to toe with Iraq and seemed to relish the physicality of the Lions of Mesopitamia. This was eloquently shown with fifteen minutes on the clock, a slick passing move evading the sharp pressing of Iraq saw Almoez Ali play through Abdulaziz Hatem although the final ball was just too long but the signs where all there. As for Iraq, they pressed and harried and showed glimpse of attacking potential as the half progressed. Teenager striker Muhanad Ali was leading the line well, and was at the heart of the action in attack. The youngster perhaps should have scored the opener when a mistake from Akram Afif was pounced on by Ali but a poor first touch saw the young striker clatter into the Qatar keeper Saad Al Sheeb and pick up a yellow card. Whilst minutes later Iraq pushed a long bal forward to see Muhanad Ali brace though but Al Sheeb had recovered, and charged out to clear the ball. With minutes left in the half, Qatar and Abdulkarim Hassan clipped the woodwork for a second time from a deflected shot from the byline. The resulting corner skimmed off Bassam Al-Rawi and wide. Into the second half, and Qatar spurned an early chance to take the lead. 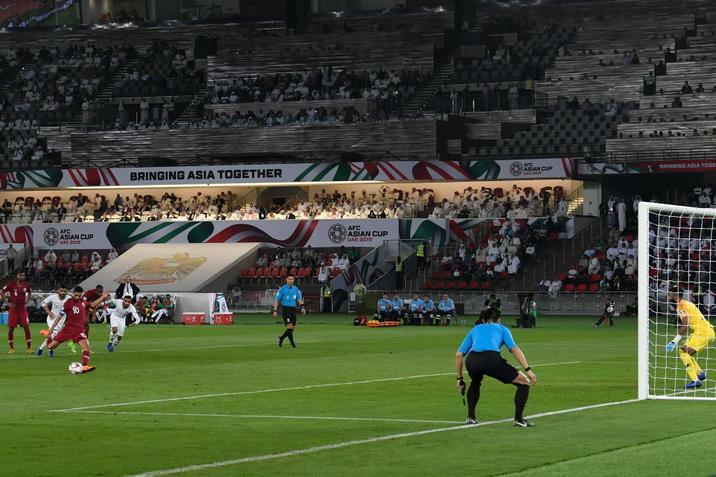 Akram Afif latched onto a goal kick, however the first touch was lacking from the Al Sadd winger and the ball was promptly saved by Jalal Hassan. Afif was lively on the left wing, and won the decisive free-kick just after the hour mark as Ali Husni halted the progression of the winger. Bassam Al-Rawi stepped up from range which arrowed into the bottom left-hand corner, putting Qatar into the lead. It could have easily been 2-0 for Qatar, had Hassan Haydoos reacted quickly to a through ball from Afif which was promptly snuffed out by the Iraqi defense. Iraq began to push Qatar back in search of a goal, and could have levelled had Ali Adnan’s free-kick crept a few inches to the left. The aerial bombardment began from the Lions of Mesopotamia, and Muhanad Ali was guilty of missing two key chances to level the contest. Ultimately Qatar remained resolute, defending as a unit and shutting out any crosses. One worry for Felix Sanchez will be the absence of Abdulkarim Hassan, who is now suspended for the game against the South Koreans following a yellow card for a foul on Amjad Attwan. For now, Qatar can revel in this hard-fought win but quickly the attention will turn to a Friday afternoon clash in Abu Dhabi against one of the favorites for the title, South Korea. Chance! Ali Adnan smashes a free-kick just wide! Goal! Bassam Al-Rawi opens the scoring for Qatar with a free-kick from range! Yellow card! Iraq striker Muhanad Ali picks up a yellow for a rough tackle on Qatar keeper Saad Al Sheeb! Chance! Abdulkarim Hassan smashes the crossbar! Plenty of Iraq fans present! Which is lovely to see! We are about to kick-off! How much would Qatar fans want a big 3-0 win tonight! Akram Afif has been one of the stars of the Qatar team, but did you know he has his older brother in the squad?! "It's an incredible feeling to be playing alongside my younger brother @akramafif_! I never expected it to happen when he was young because I used to hold him and take him to the football field 🧒⚽️"
Much has been made of the Aspire Zone, who trained the vast majority of the Qatar team, but Iraq has their own world famous football school! Can Iraq do the business tonight? A traditional powerhouse of Asian football, they have struggled in recent years but have looked inspired this tournament, especially in the 3-2 come from behind win against Vietnam! 2019 🧔 Putting on his national team's shirt! Last Thursday's game against Saudi Arabia took a big toll on the side, especially captain Hassan Haydoos who missed a penalty. Thankfully in a exclusive interview with beIN, the Al Sadd man revealed he had plenty of help from his team-mates. So here we go! It's a huge game in prospect for Qatar, who has impressed so far in the Asian Cup. The party starts at 19:00 Mecca in Abu Dhabi! Good evening! Welcome to the Live Updates of Qatar Vs Iraq in the Asian Cup. Fresh from defeat Saudi Arabia 2-0 to top Group E, undefeated Qatar face off against Iraq in Abu Dhabi. As ever, join me for all the latest build-up, team news and match commentary including the goals as they go in!